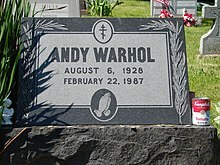 Andreas Warhola (Anglice Andrew Warhol, natus 6 Augusti 1928, mortuus die 22 Februarii 1987), qui cognomine Andy notus est, fuit unus ex ducibus motus artis oculorum "ars pop" appellati. Cursu inlustrator commercii feliciter constituto, ille factus est artifex clarus atque aliquando controversus. Sua opera coniunctiones inter "expressionem" artificiosam, culturam celebritatis, et artem mercatoriam exploraverunt. Museum Artis Hodiernae Andreas Warhola Medzilaborce in oppido Slovaciae. Pater anno 1914, mater anno 1921 in Civitates Foederatas immigraverunt, cives antea Imperii Austrohungarici, ex ea regione quae hodie Slovacia appellatur oriundae. Pittsburgi in urbe natus, Andreas Warhola alumnus fuit Instituti Technologici Carnegie eiusdem urbis. Laboravit in multis mediis, inter quae pictura, sculptura, cinema, et musica. Interview Magazine condidit, et multos libros conscripsit, inter quos The Philosophy of Andy Warhol et Popism: The Warhol Sixties. Ille fuit inlustris vir gay qui aperte sic vivebat ante motum liberationis gay. Eius officina (Anglice The Factory appellata) erat locus celeberrima, ubi egregii homines altissimi mentis, drag queens, scriptores ludorum scaenicorum, homines viarii Bohemiani, famosi ex Hollywood, et patroni divites inter se congrediebantur. Excogitavit dictum "quindecim minuta famae," latissime agnitum. Maximum pretium pro pictura Warholae solutum est $100 000 000, pro tabula 1963 Eight Elvises inscripto. Hoc negotium privatum nuntiatum est in commentario in diario The Economist anno 2009 vulgato, qui Warholam "vervicem mercatus artis" appellavit. Hoc est pretium quod solum Pollock, Picasso, van Gogh, Renoir, Klimt, et de Kooning adsecuti sunt. Warhola Novi Eboraci in urbe mortuus est die 22 Februarii 1987. Tabulae eius notissimae sunt pressiones superpictae hominum illustrium (ut puta Elvis Presley, Goethe, Mao Zedong et Marilyn Monroe). Warhola fuit res multarum exhibitionum retro, librorum, et pellicularum tam principalium quam documentariarum. Pittsburgo in urbe Pennsilvaniae, ubi natus est, The Andy Warhol Museum eius vitam et opera celebrat. Alterum museum, nominibus WarholCity et The Andy Warhol Museum of Modern Art, Medzilaborce in urbe Slovaciae conditum est. ↑ "A special report on the art market: The Pop master's highs and lows". The Economist. November 26, 2009 . 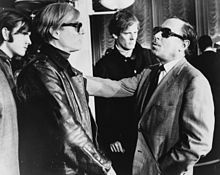 Warhol (laeva) et Tennessee Williams (dextra) in navi SS France anno 1967 inter se sermonem conferunt; a terga parte, Paulus Morrissey. "A symposium on Pop Art." 1963. Arts Magazine, Aprilis: 36–45. Bockris, Victor. 1997. Warhol: The Biography. Novi Eboraci: Da Capo Press. ISBN 030681272X. Colacello, Bob. 1990. Holy Terror: Andy Warhol Close Up. Novi Eboraci: HarperCollins. ISBN 0060164190. Dillenberger, Jane D. 2001. The Religious Art of Andy Warhol. Novi Eboraci: Continuum International Publishing Group. ISBN 082641334X. Doyle, Jennifer, Jonathan Flatley, et José Esteban Muñoz, eds. 1996. Pop Out: Queer Warhol. Durhamiae: Duke University Press. Foster, Hal. 1996. The Return of the Real. Cantabrigiae Massachusettae: MIT Press / October Book. Garrels, Gary. 1989. The Work of Andy Warhol. Discussions in Contemporary Culture, 3. Beacon, Novi Eboraci: Dia Art Foundation. Guiles, Fred Lawrence. 1989. 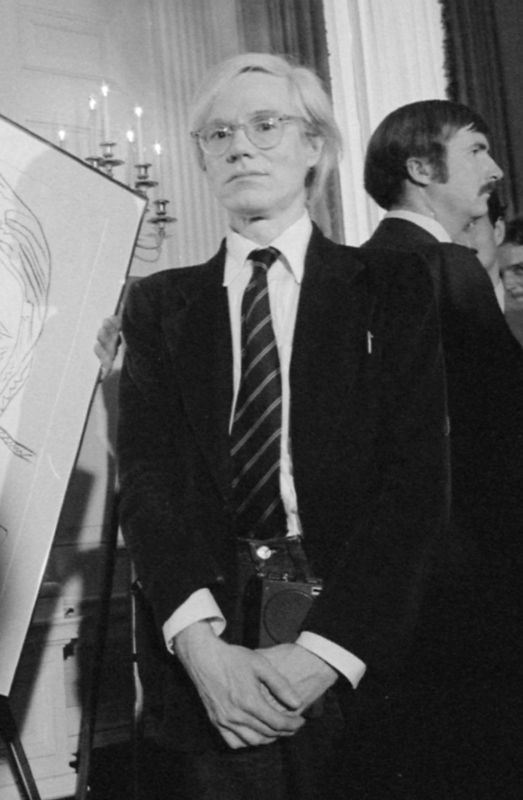 Loner at the Ball: The Life of Andy Warhol. Novi Eboraci: Bantam. ISBN 0593015401. James, James. 1989. Andy Warhol: The Producer as Author. In Allegories of Cinema: American Film in the 1960s, 58–84. Princetoniae: Princeton University Press. Koestenbaum, Wayne. 2003. Andy Warhol. Novi Eboraci: Penguin. ISBN 0670030007. Krauss, Rosalind E. 1999. Warhol's Abstract Spectacle. In Abstraction, Gesture, Ecriture: Paintings from the Daros Collection, 123–133. Novi Eboraci: Scalo. Lippard, Lucy R. 1970, 1985. Pop Art. Londinii: Thames and Hudson. ISBN 0500200521. Livingstone, Marco, Dan Cameron, et Royal Academy. 1992. Pop Art: An International Perspective. Novi Eboraci: Rizzoli. ISBN 0847814750. Michelson, Annette. 2001. Andy Warhol (October Files). Cantabrigiae: MIT Press. Scherman, Tony, et David Dalton. 2009. POP: The Genius of Andy Warhol. Novi Eboraci: HarperCollins. Suarez, Juan Antonio. 1996. Bike Boys, Drag Queens, & Superstars: Avant-Garde, Mass Culture, and Gay Identities in the 1960s Underground Cinema. Indianapoli: Indiana University Press. Watson, Steven. 2003. Factory Made: Warhol and the 1960s. Novi Eboraci: Pantheon. ISBN 0679423729. Yau, John. 1993. In the Realm of Appearances: The Art of Andy Warhol. Hopewell Novae Caesareae: Ecco Press. ISBN 0880012986. Statua Andreae Warholae Bratislavae Slovakiae sita. Vicicitatio habet citationes quae ad Andream Warholam spectant. Vicimedia Communia plura habent quae ad Andream Warholam spectant. Novissima mutatio die 16 Aprilis 2015 hora 12:23 facta.